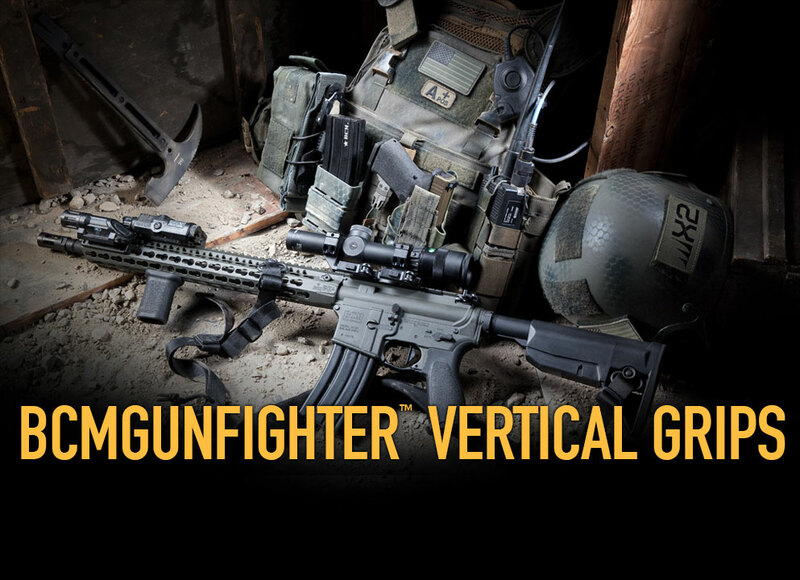 Built around real-world ergonomics, BCMGUNFIGHTER Vertical Grips are designed to improve the shooter interface with their weapon system, allowing for faster acquisition or more exacting control. Available in short and full sizes, BCMGUNFIGHTER Vertical Grips are built with both tooless QD and patented ultra light interfaces for direct attachment to M-LOK®*, KeyMod™ and 1913 Picatinny handguards. Taking advantage of the industry leading versatility offered in the KeyMod™ standardized system, this new Mod 3 Vertical Grip features a patent pending snag free internal mounting system. Based on direct feedback from the country’s premier gunfighters, the BCM Engineering Team developed an ultra-compact and ultra-light accessory designed to improve a shooters’ interface with the weapon. The BCMGUNFIGHTER Mod 3 Vertical Grip is available now, optimized for our MCMR handguard. Featuring all the ergonomics and innovations of our KeyMod and Picatunny interface vertical grips, the Mod 3 weighs just 1.9 ounces and is both the latest in and lightest variant of our Vertical Grip fleet. The 1913 Mod 3 Vertical Grip features a new, patent pending, BCM® Direct Mount Picatinny 1913 Interface System that not only secures to the mounting surface, but spreads the energy and force throughout the accessory. The BCM® Direct Mount Picatinny 1913 Interface System is the most rigid, light-weight, and cost effective system available for Vertical Pistol Grips and Hand Stops today. Where conventional and commercial mounting systems allow for shifting and flexing of the accessory, the BCM® Direct Mount 1913 Interface System reduces those issues and offers a more secure lockup, virtually eliminating play in the mounting surface. Featuring aggressively textured flat sides for improved yaw control during firing and non-firing manipulations, the grip angle has been biomechanically derived to create a more natural interface from wrist to forearm, aiding both speed and consistency during user employment. BCMGUNFIGHTER Vertical Grips are made in the U.S.A., manufactured from high quality, impact resistant polymers and available in Black, Wolf Grey, Flat Dark Earth and Foliage Green.